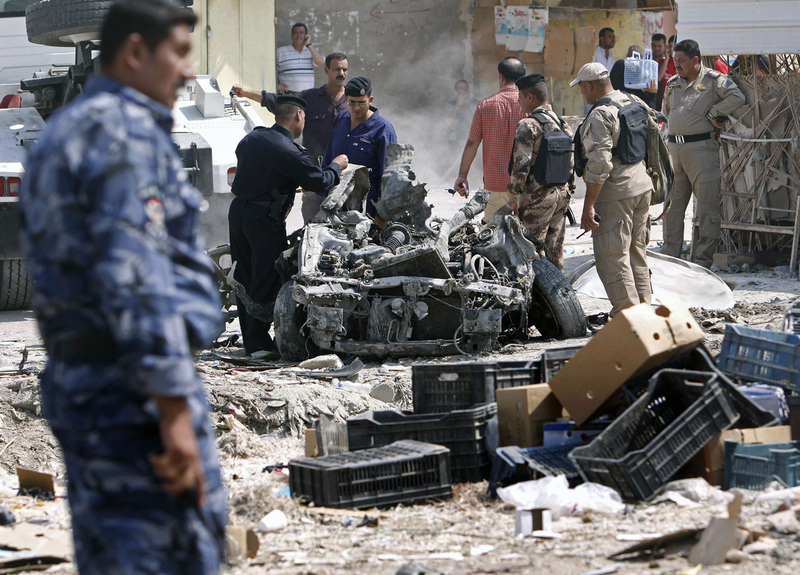 (AP) BAGHDAD - Insurgents killed at least 64 people in a wave of attacks against Iraqi security forces on Sunday, gunning down soldiers at an army post and bombing police recruits waiting in line to apply for jobs, officials said. The violence, which struck at least a dozen cities and wounded 285 people, highlighted militant attempts to sow havoc in the country and undermine the government. There was no immediate claim of responsibility for the attacks, but security forces are a frequent target of al Qaeda's Iraq branch, which has vowed to reassert itself and take back areas it was forced from before U.S. troops withdrew from the country last year. "What kind of life is this?" said Safeen Qadir, 26, a university student in Kirkuk. He described dead bodies and weeping, shouting relatives at bombing scenes in Kirkuk, where three midmorning explosions killed seven and wounded about 70. "Because of the daily explosions, we must write our wills before go out of home," Qadir said. "The death exists in every inch of the city of Kirkuk, and no one is spared from the crime of terrorism." In Sunday's deadliest attack, gunmen stormed a small Iraqi Army outpost in the town of Dujail before dawn, killing at least 10 soldiers and wounding eight more, according to police and hospital officials in the nearby city of Balad, about 80 kilometers (50 miles) north of Baghdad. The officials spoke on condition of anonymity as they were not authorized to release the information to reporters. Hours later, a car bomb struck a group of police recruits waiting in line to apply for jobs with the state-run Northern Oil Co. outside the northern city of Kirkuk. City police commander Brig. Gen. Sarhad Qadir, no relation to the university student, said seven recruits were killed and 17 wounded. He said all the recruits were Sunni Muslims and blamed the early morning attack on al Qaeda. The carnage stretched into the country's south, where bombs stuck to two parked cars exploded in the Shiite-dominated city of Nasiriyah, 320 kilometers (200 miles) southeast of Baghdad. The blasts were near the French consulate and a local hotel in the city, although the consulate did not appear to be a target of the attack. Local deputy health director Dr. Adnan al-Musharifawi said two people were killed and three were wounded at the hotel, and one Iraqi policeman was wounded at the consulate. Al-Musharifawi said no French diplomats were among the casualties. In Paris, France's Foreign Ministry said it "condemns with the greatest severity" the wave of attacks. In a statement, the ministry said it "especially condemned" the attack outside France's honorary consulate in Nasiriyah, which killed an Iraqi police officer and wounded a passer-by. A statement by Iraq's Interior Ministry blamed al Qaeda for the onslaught. "The attacks today on the markets and mosques are to provoke sectarian and political tensions," the statement said. "Our war against terrorism is continuing, and we are ready." Al Qaeda's Iraq franchise, also known as the Islamic State of Iraq, has for years had a hot-and-cold relationship with the global terror network's leadership. The two shared the goal of targeting the U.S. military in Iraq and, to an extent, undermining the Shiite government that replaced Saddam Hussein's regime. But al Qaeda leaders Osama bin Laden and Ayman al-Zawahri distanced themselves from the Iraqi militants in 2007 because their attacks also killed Iraqi civilians instead of focusing on Western targets. A string of smaller attacks Sunday also struck nine other cities, including Baghdad. Roadside bombs killed 17 people in Baghdad, including security forces, in four separate strikes that hit both Sunni and Shiite neighborhoods. the officials said. Also, gunmen killed three security officers and wounded a fourth at a checkpoint in the town of Abu Ghraib, just west of the capital. Two gunmen were killed in the firefight, and a third was captured. The rest of the attacks were car bombs that hit cities stretching from the southern port city of Basra, Iraq's second largest, to the city of Tal Afar northwest of Baghdad, near the Syrian border. The blast in Basra killed three people and wounded 24, while the bomb in Tal Afar killed two passers-by and wounded seven, officials said. A pair of car bombs in southern Maysan province killed five people and wounded 40 outside a Shiite shrine to Imam Ail al-Sharqi, said the holy site's director, Ammar Abdullah. A roadside bomb in Taji, just north of Baghdad, left two passers-by dead and 11 injured, and explosions in the Sunni towns of Hawija and Ar Riyad, outside the flashpoint city of Kirkuk north of Baghdad, wounded seven people. In Tuz Khormato near the city of Kirkuk, 180 miles north of Baghdad, a car bomb outside of a market killed four and wounded 41 people, said Salahuddin provincial health director Raeed Ibrahim. And in Kirkuk itself, Qadir said three midmorning explosions, two car bombs and a roadside bomb, killed seven and wounded about 70. Kirkuk has been a flashpoint for years with its mix of Sunni Arabs, Kurds and Turkomen, who all claim rights to the city and the oil-rich land that surrounds it. Kurdish leaders long have sought to draw Kirkuk into their self-rule region of Iraq's three northernmost provinces, and have pushed for a census to determine the city's ethnic majority. But the majority Arab central government in Baghdad has delayed the census, which could incite widespread ethnic violence over Kirkuk's future.